Amazon has announced the new Kindle Fire family, with four new models to choose from. Two of them are new versions of the Kindle Fire HD 7and the Fire HDX 8.9, while they have also launched the new Fire HD 6. The fourth model is a completely new challenge: the Kindle Fire HD Kids. The Kindle Fire HDX 8.9 has a screen resolution of 2560 x 1600 pixels (339 ppi). It features a quad-core processor running at 2.5 GHz and comes with 16, 32 or 64 GB of internal storage. It includes two cameras, a rear 8 MP and a 720 pixels front one. It comes with Wi-Fi connectivity and there is also a model with 4G available. Amazon says the battery is sufficient for 12 hours of mixed use and it includes a Mayday button with personalized support 24 hours a day. The fire HDX 8.9 is available from $379 on the Amazon website. 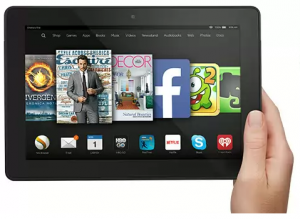 The Kindle Fire HD 7 is a 7-inch tablet with a resolution of 1280 x 800 pixels. It is powered by a 1.5 GHz quad-core processor and it is available with 8 or 16 GB of internal storage. As in the previous case, the Fire HD 7 also has two cameras, although they are not as good as those installed in the HDX 8.9 model. In this case, the rear camera has 2 MP, whereas the front one is a VGA. It has Wi-Fi connectivity and a battery big enough for 8 hours of mixed use. In this case, it does not include the Mayday support, but they offer help through email, web or phone. The Kindle Fire HD 7 is available from $139 on the Amazon website, and we can choose between 5 colors: white, black, magenta, yellow and cobalt blue. The Kindle Fire HD 6 is a 6 inch tablet with 1280 x 800 pixel resolution. It features a quad-core processor running at 1.5 GHz and it comes with 8 or 16 GB of internal memory. The Fire HD 6 includes the same cameras than the previous model and offers the same autonomy. It is available from $99 and we can also choose from the same 5 colors as the HD 7 model. Amazon has also introduced a tablet for children, designed to compete directly with Fuhu and Samsung tablets. There are two models available: one with a 6-inch screen (for $ 149) and one with a 7 inches one (for $ 189). Surprisingly, Amazon has decided to include an unconditional two year warranty, so if anything happens to the tablet, you can get a new one. Whatever the reason. 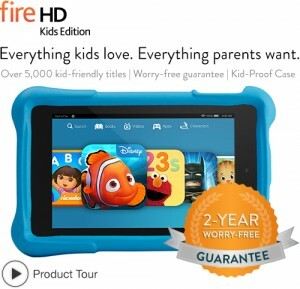 Also, when buying the Kindle Fire HD Kids, you will have a year of Amazon Free Time Unlimited. This means that children can read, watch movies or TV shows, or play all they want for a whole year. A really sweet offer from Amazon.